Welcome to Part 2 of our Pressure Cooking Guide where you'll learn all about cooking with a pressure cooker, both stovetop and electric. We'll help you decode those kooky pressure cooking recipe directions too. By the way, in case you missed it you can go back to Part 1 of our helpful Guide where we chat about WHY to use a cooker and which foods should and should not be cooked using this method. If you already have a pressure cooker and you know how to use it, then feel free to jump directly to Part 3, Pressure Cooking Dried Beans and Grains. There are two types of pressure cookers out there, the conventional stovetop and the more "new-fangled" electric. People seem to be diehard fans of one or the other. There are pros and cons of each, which I'll review below. If you're in a hurry, just click the cooker you have (or want!) to jump down the page. If you've ever seen a recipe meant to be pressure cooked and you don't know how to work one of these things, then you have likely been mystified wondering how anybody understands it. I know I always was! remaining ingredients to the cooker. pressure and cook for 20 minutes. "STOP! What the heck does all of this jargon mean?" Let's break it down so you can read most of the pressure cooker recipes you come across. Okay, the first couple sentences are pretty self-explanatory. In this case, add the water to your cooker, bring to a simmer, then add remaining ingredients. Lock the lid into place - This means you will lock the lid into place according to your cooker's instructions. You may have to apply pressure to the opposite end of the lid (opposite of the handle), especially with new cookers. Over high heat bring to high pressure - Now, every cooker is just slightly different in regards to showing high pressure, so you have to read your instruction manual to know exactly what you're looking for. Most cookers also have something called "a pressure indicator". This is separate from a low- or high-pressure indicator. It simply tells you "Hey, there's enough pressure built up in this pot now that you can't open it." It's a safety mechanism in place for your protection. Lower the heat just enough to maintain this pressure and cook for 3 minutes - If your stove is gas, the heat is very responsive. So simply bring your flame to low or medium-low. Your goal is to keep your cooker at high pressure for the entire cooking time. If your stove is electric, then you may have to remove your cooker from the direct heat as you wait for the heat of the burner to come down to low or medium-low. As you get to know your cooker, you will understand how to play with the heat of electric stoves in order to regulate the temperature correctly. In either case, when your cooker has reached high pressure, set the timer for 20 minutes. Again, you don't start the timer until high pressure has been reached. Turn off heat and allow pressure to come down naturally - Turn off heat and allow cooker to rest until the "pressure indicator" has come down, meaning there is no more pressure in the pot and you can safely open the lid. If you are using an electric stove, remove the cooker from the heat source. Carefully remove the lid - be aware of the steam. Stir. Your brown rice is ready to eat! Note: Whenever you see a recipe that calls for "natural pressure release" or "allow pressure to come down naturally", etc., this means you are letting the cooker sit without touching it while you wait for the pressure to come down on its own. This usually takes 10 minutes, but can take longer depending on the amount of pressure in the pot. Otherwise, your directions might say "quick release". This means you are NOT supposed to wait for the pressure to come down entirely on its own. You will instead carefully bring your cooker to your sink. Set the cooker in the sink, and run cold water over the lid until the pressure comes completely down (there is usually an audible release of pressure). You will know it's safe to open the lid when you see that the "pressure indicator" has gone down completely into its little resting place. Caution: If at any point in the cooking process your cooker emits a loud noise of steam release, your pressure is too high. Either lower your gas flame, or remove your cooker from your electric heat source until the pressure comes down to normal levels! Don't worry, cookers worth their weight in gold will still be entirely safe, but they can sure make a racket and a mess as steam spits out all over the place. NEVER LEAVE YOUR STOVETOP COOKER UNATTENDED! Electric cookers are much easier to use. Don't blink or you'll miss it. Place ingredients in the inner pot of your cooker. Lock the lid in place. Set the timer. Press start. The cooker will come to pressure, start the countdown when pressure is reached, then go into warm mode and bring the pressure back down. Stir. It's ready to eat. Okay, CLEARLY it's easier to use an electric cooker. So why would you even CONSIDER a stovetop? If you have a gas stove and the electricity goes out, you can still use it. Duh. They're extremely reliable, usually last for years and years. They almost become like a member of the family. That's because it's low tech. There are no electrical parts or connections that can stop working on you. Quick release is quick and easy. Great in an emergency survival-type situation because it can be used over a camping stove or campfire. 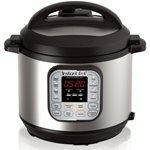 Very easy to use so it's great for beginners to pressure cooking - just set it and forget it. Many cookers these days are 3-tools-in-1 like this stainless steel cooker - it's a pressure cooker AND a slow cooker AND a steamer all rolled into one. "Sassy, what a website! You are on my Favorites bar, and your site stays open all day. There's so much to look at, you can't do it in one day -- I'm on day 3 looking!"